La Rambla o Les Rambles is by far the most popular street in Barcelona. It runs from Plaça Catalunya down to the statue of Christopher Columbus beside the sea. There is a tourist office right on the top of Les Rambles in case you need a map or anyotherinformation you may need. Along the way you see flower stalls, animal stalls, kiosks, street performers, human status. There are also lots of hotels and restaurants. No matter what day or time you go, it is always croweded with tourists and locals. Halfway down on the right hand side you will find El Mercat de La Boquería (La Boqueria Market), which is the most famous foodmarket in Barcelona. At the bottom of Les Rambles, there is a huge monument to Christopher Columbus where it is posible to take the elevator to the top for a really nice view of Les Rambles and the Port. 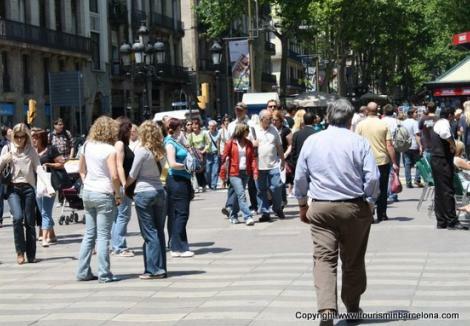 Finally, be aware of pickpockets and be extra-careful with your belongings (wallets, handbag, camera, …).